The Unionist government rarely used the Special Powers Act to intern political opponents between 1945 and its re-introduction in 1956. One of the only occasions on which it did so was in May 1951 to coincide with a visit to Belfast by members of the British royal family. The Unionist government had used internment in a similar way on various occasions in the 1930s. 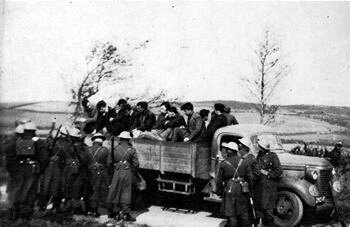 The public outcry in 1951 appears to have determined that future uses of internment would be unofficial, such as during another such royal visit in May 1953, when the RUC instead questioned or put specious charges against leading republicans to detain them during the visit. In 1951, on the night of 30th May, the RUC carried out a series of raids in which they arrested thirteen republicans and detained them under the Civil Authorities (Special Powers) Act. Forty-eight hours beforehand, a bomb had gone off outside Cullingtree Road RUC barracks. It had not been planted by the IRA, yet those arrested were mostly involved with the IRA including the Belfast Battalion O/C Jimmy Steele and Adjutant, Joe Cahill, and other prominent members like Joe McGurk and Liam Burke. Sinn Féin in Belfast had been planning a non-violent protest against that royal visit that was to take place on the night of the 31st May. The RUC then publicly announced that they had issued internment orders for thirteen republicans under the Special Powers Act coinciding with a visit by the British Queen to Belfast. The RUC announced that they were going to hold the men for seven days under the Special Powers Act as a ‘security measure’ (see press on 30th May 1951). Meanwhile, Jimmy Steele and the other twelve republicans were brought to the prison on Crumlin Road, taken to the reception area and processed into the remand area in C wing. They were photographed and had their fingerprints taken (for some of the thirteen this was the third time this had happened since their arrest). Despite being imprisoned under an internment order, for the seven days they were held there, the republicans were subject to remand conditions. That meant taking exercise with the remand prisoners observing the ‘five yards apart’ and ‘silence’ rules, the number 2 diet and no association or other ‘privileges’. Remand prisoners were also limited to two cigarettes in the morning and two in the evening. With so much collective experience of the various regimes including juvenile, remand, sentenced, penal and internee, Steele, McGurk, Cahill, Burke and the others quickly objected and notified the prison authorities that they wouldn’t accept the remand conditions. The response of the authorities was to inform them that, if they did not comply with the order, they would be returned to their cells. As they refused to comply with the remand regulations, they were returned to their cells and all privileges withdrawn. It had been early on Tuesday morning when they had been detained and they were to remain confined to their cells once they refused to observe the five yards apart and silence rules. The internees only got out of their cells on the Sunday morning to attend mass in the prison chapel. The next day, Monday 4th June, they were informed that they were being released again, in ten minutes time. As they walked out through the wicker gate of Crumlin Road, at about 12pm a plane bearing their royal majesties had already left the runway at Aldergrove that morning and was half way to London. That evening, Jimmy Steele and Joe Cahill issued a statement on behalf of themselves and Liam Burke, Patrick Doyle, Joe McGurk and Jack McCaffrey. (c) Why, if such evidence was available, was not that specific charge framed against us? There was no answer forthcoming from the Unionist government.